Sam Hurd is an American football wide receiver for the Dallas Cowboys of the National Football League. Entering his fifth pro season, Sam Hurd provides the Dallas Cowboys with a reliable option in both the team's receiving corps as well as the special teams units. He took full advantage of training camp injuries to Patrick Crayton, Terry Glenn and Terrell Owens and impressed coaches enough to earn a spot on the active roster as a rookie free agent in 2006 where he earned two starts in multiple receiver sets but spent most of his rookie season on special teams. He has since left his mark as a consistent receiver when called upon and as an impact player on special teams, where he led the squad in 2009 with a career-high 19 stops. # Played in 16 games with one start, catching seven passes for 121 yards (17.3 avg.) with one touchdown. # Also led the team with a career-best 19 special teams tackles. # Opened the season at Tampa Bay (9/13) with a season-high three special teams tackles. # Made his first reception of the season against the N.Y. Giants (9/20) on a seven-yard catch while also adding a special teams stop. # Led the team with a season-high 62 receiving yards on a season-high three receptions with a career-long catch of 53 yards at Denver (10/4). # Recorded his second career touchdown on a 36-yard reception against Seattle (11/1) and had two special teams tackles in the game. # Made his lone start of the season against Washington (11/22) and made a special teams tackle. # Landed on Reserve/Injured Oct. 16 with a recurring ankle injury after playing in just three games. # Saw most of his action on special teams and finished the season with one tackle. # Missed the first three games of the season due to a high ankle injury suffered in the final preseason game against Minnesota (8/28). # Made his first appearance of the 2008 season against Washington (9/28) though he did not record any stats. # Re-injured his ankle at Arizona (10/12) and placed on Reserve/Injured four days later. # Again aided by injuries to the receiving corps, played in all 16 games with two starts as the team's full-time third receiver. # Finished the year with 19 catches for 314 yards - both career-highs - and his first career touchdown reception. # Was also sixth on Dallas' special teams coverage units with 15 tackles. # Had his first career touchdown on a then career-long 51-yard catch in the season opener against the N.Y. Giants (9/9). # Helped Dallas remain undefeated with a tipped ball on an onside kick that was recovered by Tony Curtis which led to the game-winning field goal at Buffalo (10/8). # Started at receiver in place of Crayton (ankle) and had a catch for eight yards against the N.Y. Jets (12/22). # Had a season-best three catches at Carolina (12/22). # In the season finale at Washington (12/30), led the team with a season-best 64 yards on a season-high tying three catches. # One of just three rookie free agents to make the roster out of training camp - along with Miles Austin - and played in 15 games with two starts. # Saw most of his action on special teams, finishing third with 16 tackles. # Made his NFL debut on Sunday night against Washington (9/17). 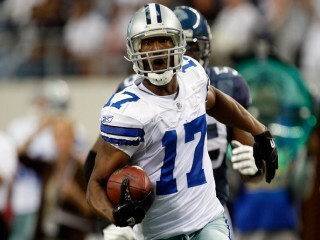 # Logged his first career reception against Houston (10/15) on a 33-yard pass from Tony Romo. # Following the Sunday night win at Carolina (10/29), earned NFC Special Teams Player of the Week honors after forcing and recovering a fumble on a kickoff return to set Dallas up at the Panthers 14-yard line. # With Glenn nursing an injured quad, made his first career start at Arizona (11/12) and responded with 42 yards on four receptions, including two for first downs. # At the N.Y. Giants (12/3) recovered a fumble by Mathias Kiwanuka following an interception of Romo to set Dallas up to score its first touchdown of the game. # Made his second career start against New Orleans (12/10) when the club opened in a four-receiver set. # Finished his career at Northern Illinois in the top-five in three receiving categories: second in career receiving yards (2,322), third in career receiving touchdowns (21) and tied for fifth in career receptions (143). # Broke the single-game school record with 266 receiving yards against Central Michigan. # After his senior season in 2005, was named Honorable Mention SportsIllustrated.com All-America and first-team coaches All-Mid American Conference. # Started all 12 games and recorded 65 catches for 1,074 yards and 13 touchdowns. # As a junior, played in 10 games and finished with 27 receptions for 298 yards and three touchdowns. # Played in 12 games, including seven starts, and had 29 catches for 438 yards and two touchdowns as a sophomore. # Played in 12 games as a true freshman in 2002, including two starts, and finished with 22 catches for 512 yards and three touchdowns. # Samuel George Hurd earned several accolades after his prep career at Brackenridge High School in San Antonio, Texas, where he was a three-sport letterman - three years in basketball and two in track. # As a senior, had 60 receptions for 1,639 yards and 23 touchdowns. # Was a pre-communications major at Northern Illinois. View the full website biography of Sam Hurd.